Politicians in an Australian state could be breathalysed before voting after reports of bad behaviour by MPs. In the latest incident, New South Wales MP Andrew Fraser resigned from his frontbench role after shoving a female MP after attending a Christmas party. In September, state police minister Matt Brown resigned after allegedly dancing in his underpants at a drunken party in his parliamentary office. Several MPs have now backed a proposal to supply breath test kits. "Honestly, if you are going to have breathalysers for people driving cranes you should have breathalysers for people writing laws," New South Wales Greens MP John Kaye told the Sydney-based Daily Telegraph newspaper. Barry O'Farrell, leader of the coalition opposition, said he would gladly submit to an alcohol test before entering parliament. And the Speaker Richard Torbay said he would have no problem with the idea as long as tests were voluntary. "I think it is important to establish high standards that the community expects," Mr Torbay told the Telegraph. Health minister John Della Bosca said that, in his experience, MPs took their obligations seriously. But he said he had no objections to installing a breathalyser machine in the parliament bar. The Daily Telegraph also joined the debate, running a front page headline "Breath test this mob" and writing in an editorial: "If our politicians are drunk on the job, we've a right to know." Support for the idea has also come from the Rail, Bus and Tram Union, which said MPs should undergo the same tests as its members. "All rail workers are subjected to random drug and alcohol tests, an infringement on their personal lives that they are told is necessary due to the safety-critical nature of their work," said secretary Nick Lewocki. "But driving the state is every bit as safety-critical, and decisions our politicians make on issues as diverse as health, education and transport policy do affect public lives." 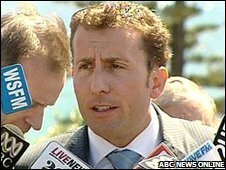 The altercation involving Mr Fraser, an opposition MP, happened on Tuesday night when he was involved in a heated exchange with Labour MP John Aquilina. When Mr Fraser's National Party colleague Katrina Hodgkinson tried to intervene, he shoved her away. NSW National Party leader Andrew Stoner told the Sydney Morning Herald that Mr Fraser had earlier been at the NSW Farmers Federation Christmas drinks party, although Mr Stoner said he did not know if his colleague was drunk. 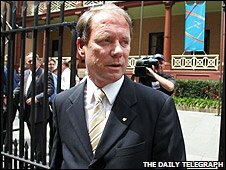 Mr Fraser is no stranger to parliamentary controversy: in 2005 he was suspended after chasing a minister around the chamber and grabbing him by the shirt before eventually being restrained.